Alongside the toll of death and broken lives, perhaps the saddest reality of the latest Gaza war, like the Gaza wars before it, is how easy it would have been to avoid. For the last eight years, Israel and the U.S. had repeated opportunities to opt for a diplomatic solution in Gaza. Each time, they have chosen war, with devastating consequences for the families of Gaza. Let’s begin in June 2006, when the University of Maryland’s Jerome Segal, founder of the Jewish Peace Lobby, carried a high-level private message from Gaza to Washington. Segal had just returned from a meeting with Ismail Haniyeh, whose Hamas faction had recently won free and fair elections and taken power in Gaza. Hamas was seeking a unity government with the rival Fatah faction overseen by Mahmoud Abbas. The previous year, Israel had withdrawn its soldiers and 8,000 settlers from Gaza, though its armed forces maintained a lockdown of the territory by air, land, and sea, controlling the flow of goods and people. Gazans believed they were trapped in the world’s largest open-air prison. For generations they had lived in overcrowded refugee camps, after their villages were depopulated by Israel and new Israeli cities built on their ruins in the years that followed Israel’s birth in 1948. By voting for Hamas in 2006, Palestinians signaled their weariness with Fatah’s corruption and its failure to deliver an independent state, or even a long-promised safe passage corridor between the West Bank and Gaza. In the wake of its surprise election victory, Hamas was in turn showing signs of edging toward the political center, despite its militant history. Nevertheless, Israel and “the Quartet” — the U.S., the European Union, Russia, and the U.N. — refused to recognize the outcome of the democratic elections, labeling Hamas a “terrorist organization,” which sought Israel’s destruction. The administration of George W. Bush strongly pressured Abbas not to join a unity government. The Quartet suspended economic aid and Israel severely curtailed the flow of goods in and out of Gaza. These punitive measures were to remain in place until Hamas renounced violence (including stopping its cross-border rocket attacks), recognized Israel, and accepted all previous agreements based on the Oslo peace accords. Which brings us back to that Washington-bound letter from Gaza. In the wake of the elections, Hamas was no longer the militant opposition to a ruling Fatah party, but a legally elected government operating under siege. Hamas leader Ismail Haniyeh, suddenly responsible for governing and facing a mounting economic, humanitarian, and political catastrophe, sought to defuse the situation. In his June 2006 hand-written note to President Bush that Jerome Segal delivered to the State Department and the National Security Council, he requested a direct dialogue with the administration. Despite Hamas’s charter calling for the elimination of Israel, Haniyeh’s conciliatory note to the American president conveyed a different message. “We are so concerned about stability and security in the area that we don’t mind having a Palestinian state in the 1967 borders and offering a truce for many years,” Haniyeh wrote to Bush. This essentially added up to an offer of de facto recognition of Israel with a cessation of hostilities — two of the key U.S. and Israeli demands of Hamas. A few lonely voices in the U.S. and Israel urged that the moment be seized and Hamas coaxed toward moderation. After all, Israel itself had been birthed in part by the Irgun and Stern Gang (or Lehi), groups considered terrorist by the British and the U.N. In the years before Israel’s birth, they had been responsible for a horrific massacre in the Palestinian village of Deir Yassin and the Irgun bombing of the King David Hotel, killing 91 people. Leaders of the two organizations, Menachem Begin and Yitzhak Shamir, later became prime ministers of Israel. Similarly, Yasser Arafat, whose Palestine Liberation Organization was considered a terrorist group by Israel and the West, recognized Israel’s right to exist in a pivotal 1988 speech, paving the way for the Oslo peace process. The Bush team, however, chose to ignore Hamas’s overture, opting, with Israel, for violence and chaos. The Obama administration would follow the same path years later. In this way, a pattern of U.S. acquiescence in ongoing, ever worsening humanitarian disasters in Hamas-run Gaza was established. Direct American political and material support for the indiscriminate killing of thousands of Gaza’s civilians, including hundreds of children, became Washington’s de facto policy. Three weeks after Haniyeh’s unanswered letter was delivered, Hamas abducted an Israeli soldier, Gilad Shalit, and fired rockets into Israel. Israel launched a massive retaliation, Operation Summer Rains, returning to a fearsome and bloody history in Gaza that would repeat itself with greater intensity in the years ahead. Israeli missiles and fighter jets destroyed the offices of the prime minister and interior minister, the American International School, more than 100 other buildings, and heavily damaged Gaza’s only power station, the sole source of electricity for hundreds of thousands of Gazans. During that operation, many Palestinians were limited to one meal a day, eaten by candlelight. More than 200 Palestinians were killed in the first two months of the conflict, at least 44 them children. Eleven Israelis died during that period. And yet, bad as it was, the death and destruction then would prove small compared to what was still to come. Since Summer Rains, more than 4,200 Gazans, including nearly 1,400 non-combatants, including more than 600 children, have been killed by missiles, bombs, and other munitions — some launched from offshore by Israel’s navy, some from land by Israeli tanks and ground forces, and some from the air by American-made F-16 fighter jets and Apache attack helicopters, part of the $3 billion in annual U.S. military aid to Israel. This includes the $276 million in bombs, grenades, torpedoes, rocket launchers, guided missiles, howitzers, mortars, machine guns, shotguns, pistols, cartridges, bayonets, and other battlefield weaponry that the U.S. has exported to Israel since January 2012. This U.S.-Israeli military-industrial alliance has provided little incentive to explore peaceful or diplomatic alternatives. In 2007, Hamas and Fatah again discussed forming a unity government. The U.S. responded with heavy pressure on Mahmoud Abbas. American officials, through Secretary of State Condoleezza Rice, had already been facilitating military training and arms shipments to his Fatah faction in Gaza. They wanted to bolster its capabilities against Hamas, allowing the U.S.’s favored Fatah leader in Gaza, strongman Mahmoud Dahlan, to take control. This scenario, laid out in “The Gaza Bombshell,” a 2008 Vanity Fair piece by David Rose, and elsewhere, was confirmed to me by an American official stationed at the U.S. Embassy in Tel Aviv at the time. Eventually, said Norman Olsen, a former State Department official and 26-year foreign service officer, the unity talks collapsed, “but not before Dahlan’s undisciplined fighters engaged in months of open protection rackets, extortion, kneecappings, car-jackings, and abductions.” Olsen knows the territory: he spent four years at the U.S. Embassy in Tel Aviv covering the Gaza Strip, making hundreds of daily trips there, and later served as chief of the Embassy’s political section, and as special advisor on the peace process to the U.S. ambassador. Indeed, as Hamas routed Dahlan’s Fatah forces, taking full control of Gaza, the two Palestinian sides — and their populations in the West Bank and Gaza — were physically separated and politically weakened. Despite the language of peace negotiations, ostensibly meant to create a “viable, contiguous” Palestinian state, the fractured reality appeared to be part of a deliberate Israeli strategy. Statehood for Palestinians seemed ever more a mirage. In the coming years, the prospects of Palestinian unity — both physical and political — remained bleak. U.S.-brokered peace negotiations focused only on the fragmented West Bank, while Israel did indeed treat Hamas-controlled Gaza as a separate, “hostile country.” It countered Hamas rocket attacks with repeated air strikes and assassinations of Hamas leaders and lower-level operatives. The American-Israeli alliance, meanwhile, continued to strongly oppose any attempts to move in the direction of Palestinian unity. This, despite sporadic efforts at reconciliation between Fatah and Hamas, and the desire of ordinary Gazans and West Bankers alike to end their isolation through a long-promised corridor between the two disconnected territories. By early 2014, Hamas’s motivation for forging a unity pact had grown stronger. War and political change in the region meant it could no longer rely on financial or military support from Iran, Syria, or especially Egypt, whose new military rulers had realigned policy in a way that put them closer to Israel than Hamas. As a result, in April, Hamas and Fatah signed a unity agreement. Hamas was again sending a clear message of its willingness to engage in political compromise, this time agreeing to turn over unprecedented power in the reconciliation government. This was far more than Hamas leader Haniyeh had offered in his 2006 overture to Bush. It met the core Western and Israeli demands of Hamas almost to the letter. Implementing it could have led to a new kind of “quiet” between Hamas and Israel, a stronger Palestinian government, and a stronger, if still fleeting, chance for a viable Palestinian state including both Gaza and the West Bank, with East Jerusalem as its capital. A few weeks later, after three Israeli teenagers were abducted and murdered on the West Bank, Israel blamed Hamas and launched Operation Brother’s Keeper. The Israeli military searched 2,200 West Bank Palestinian homes and arrested more than 400 Palestinians, mostly Hamas members, holding at least 150 people without charges. Yet reports indicated that less than 10% of those taken in were even questioned about the kidnapping. Given accounts indicating that the Israeli authorities knew within a day that the teens had been murdered (though they didn’t announce it for two weeks), it appears that Netanyahu’s government was simply using the pretext of the kidnappings as yet another attempt to crush Hamas. Meanwhile, that organization uncharacteristically denied any involvement in the act and Israel has yet to offer evidence Hamas leaders ordered it or knew about it in advance. On the contrary, an Israeli police spokesman appeared to confirm reports that Hamas leaders had no prior knowledge of the plan. By the time this was revealed, however, Hamas had already responded to the Israeli incursions on the West Bank with rockets from Gaza, and Israel, in its typically disproportionate way, had unleashed an unprecedented assault on Hamas — and on the people of Gaza. Again, Israel had chosen war over any other possible path, with full American backing and military hardware. On July 30th, amid growing calls in the international community for war crimes investigations, and four hours after the Obama administration itself condemned the Israeli shelling of a U.N. shelter and the deaths of 20 civilians, the Pentagon approved a restocking of American-made ammunition for Israel’s arsenal. 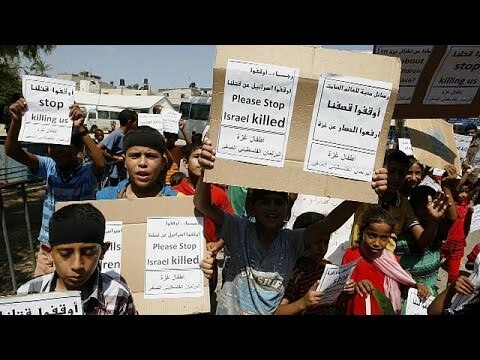 “It is deeply cynical for the White House to condemn the deaths and injuries of Palestinians, including children, and humanitarian workers, when it knows full well that the Israeli military responsible for such attacks are armed to the teeth with weapons and equipment bankrolled by U.S. taxpayers,” said Brian Wood, head of Arms Control and Human Rights at Amnesty International. In all of this, of course, Hamas is far from blameless. Its launching of thousands of rockets is a clear violation of international law. However, in 2014, as in 2006, 2008-2009, and 2012, the sheer volume of destruction and death on each side is incomparable. In 2014, Israeli’s sophisticated lethal power, in the form of tens of thousands of tons of bombs, missiles, and artillery shells rained down on Gaza, killing nearly 1,400 civilians by U.N. estimates. Sixty-four Israeli soldiers and more than 530 Gaza militants have also died. Hamas’s mostly primitive rockets, some homemade in Gaza metal workshops and others relying on Soviet-era technology, have managed to terrorize Israelis, but that country’s civilian death toll in the Gaza war of 2014 has been three. It is hard to imagine how Israel’s behavior could possibly make the country safer in the long run, given the eternal enmity it has been sowing, no matter how many Hamas tunnels it destroys in the short term. Given this, why do such indiscriminate attacks continue? The answers, I believe after years spent in the region, lie in the psychology of the Israeli state, as well as in the cold calculations of its leaders. Israel remains a deeply traumatized society whose profound anxieties are based in part on genuine acts of horror perpetrated by countless terrorist attacks over decades, and partly on an unspeakable past history in Europe. The Holocaust and its teaching in Israel have forged an existential fear of annihilation in Israeli Jewish society. (Twenty percent of Israel’s population, it’s important to remember, is Palestinian Arab.) This is true even among the large percentage of Sephardic Jews, whose families came from the Middle East and the Balkans. In recent images of terrorized Israelis crouching in shelters and by roadsides, we can see that the post-traumatic impact of the past lives on. On NPR, Ron Dermer, Israel’s ambassador to the U.S., decried the “culture of terrorism” in Palestinian society, adding: “You’re talking about savage actions… In the case of Israel, we take legitimate actions of self-defense, and sometimes, unintentionally, Palestinian civilians are harmed.” That day, the Palestinian teenager Mohammed Khdeir was abducted and burned alive, and soon afterward, Israel began bombing Gaza. In a similar fashion, Israel’s recent attacks on Gaza hospitals, schools, the area’s only power plant, U.N. schools and other facilities housing refugees with nowhere else to go, and tens of thousands of civilian buildings have set back any future statehood efforts by years, if not decades. In other words, Israel’s decisions in Gaza can be seen partly as the response of a traumatized country, but also as its leaders’ cold-eyed pursuit of a larger strategic objective — what the Israeli writer Meron Benvenisti calls a “splintering strategy.” Destroying Hamas, or at least the basis for the unity agreement with Fatah, would assumedly help guarantee that the West Bank and Gaza will remain isolated, unconnected by the corridor promised during the Oslo process. With Gaza in ruins, the West Bank is ever more “splintered” itself. There, Israeli state policies encouraging settlement expansion — including a series of financial incentives that make it cheaper to be a settler than a city dweller — have served to isolate Palestinians in ever more cutoff cantons, controlled by hundreds of roadblocks, checkpoints, and roads reserved for settlers and VIPs. Meanwhile, Israel’s hardening position in negotiations with Abbas, the weak and unpopular leader of a rump Palestinian Authority in the West Bank, has placed huge swaths of settlement blocs and miles of the Jordan Valley off limits for a future Palestinian state — unless the U.S. or another party intervenes to change the status quo. In other words, the destruction of Gazan neighborhoods and significant aspects of the area’s infrastructure should be seen as part of Israel’s larger objective: dividing Palestinians from one another and so deep-sixing the possibility of genuine self-determination. As early as 1973, Ariel Sharon, one of the founders of the Likud party and a champion of the settler movement, described his aim as putting so many settlements on the West Bank that they would become impossible to remove. Three decades later, Sharon and his advisors had essentially realized that strategy. In a 2004 letter to Sharon, President Bush wrote that, “in light of new realities on the ground, including already existing major Israeli population centers [i.e. settlements], it is unrealistic” to forge a two-state solution based on the 1967 borders between Israel, the West Bank, and Gaza. On July 11th, Prime Minister Netanyahu more formally clarified Israel’s intentions. “There cannot be a situation, under any agreement, in which we relinquish security control of the territory west of the River Jordan,” Netanyahu stated. For anyone weak on his or her Middle Eastern geography, that is an area that includes all of the West Bank. In other words, Israel, finally, officially has no interest in a two-state solution. Did Hamas Win the Gaza War of 2014? Throughout much of its history, Israel has made a practice of engaging in overwhelmingly disproportionate response — “going wild,” to quote Tzipi Livni — in response to threats real or perceived. In recent years, this strategy has also had a way of backfiring, notably in 2006, when Hezbollah emerged stronger after Israel’s invasion of Lebanon. With its latest onslaught in Gaza, Israel may again be emboldening an enemy while creating worldwide sympathy for the Palestinian people, momentum for global boycotts, and an embittered generation of young Palestinians with, undoubtedly, revenge in their hearts. At this writing, the outcome of indirect negotiations between Hamas and Israel is impossible to predict. Hamas’s hand was strengthened, however, by calls within Israel for direct talks with the Islamic organization and by increasing international calls for an end to Israel’s blockade. Fatah leaders, meanwhile, have spoken out recently in support of the unity agreement, thus strengthening prospects for long-time reconciliation between Hamas and Fatah — the very condition Israel went to such lengths to destroy. In other words, Hamas could end up “winning” the Gaza war of 2014, though the losers, as always, are the people of Gaza. Sandy Tolan, a TomDispatch regular, is author of The Lemon Tree: An Arab, a Jew, and the Heart of the Middle East, and the forthcoming Children of the Stone, about the building of a music school under occupation in the West Bank. He is an associate professor at the Annenberg School for Communication and Journalism at USC.